Mrs Helicopter Writes: Anorexia is NOT Narcissism. On Sunday this weekend, The Telegraph published an interview with Joan Bakewell in which she pondered if Anorexia Nervosa, endemic amongst young girls today, was purely narcissistic. It was an ill informed statement at best but I think quite representative of what a lot of the older generation think of their younger counterparts. And it’s dangerous. She has since apologised, retracted and explained that she didn’t know her comments would be published. I still feel that even with an apology, her thought process needs some addressing. Let’s get one thing clear from the start. Anorexia is NOT narcissistic. A narcissicist is a very specific personality trait and nothing to do with having a mental illness. A severe mental illness, which IS what Anorexia is. And it has a high death toll. It has the highest mortality rate of any mental illness. It’s not about appearance, it’s about control. Controlling what goes in your mouth very often as result of not being able to control events around you. 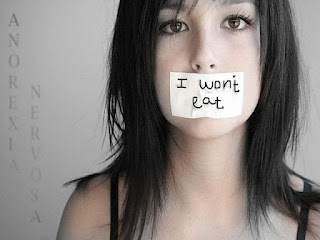 And this not eating, or eating in a disordered way is a symptom of a much deeper psychological issue. It’s almost like asking a self harmer if they cut their arms to match their outfits! Although it may appear rife amongst models, young actresses and pop stars there are reasons why they might be more susceptible to mental illness that goes beyond a vain obsession with their looks. People in the public eye are often emotionally vulnerable, under constant scrutiny and pressure from the industry and peers to look their best. It seems to me that the main reason anyone suffers anorexia in these circumstances is a clamouring to regain control. Anorexics very rarely look in the mirror with their bones jutting out at awkward angles and think “I look fantastic!”. In fact for anyone with disordered eating, appearance is low down on the priority list. For example, a lot of bulimic people are overweight or even obese. I should know, I was bulimic for years and my weight fluctuated wildly. And I can say with some certainty that my bulimia started in a time of extreme emotional turmoil and had very little to do with how I looked. For me it was way of punishing myself for my own greed and hatred of myself at a time when I felt desperately alone. The thought that someone could accuse me of vanity leaves an even more sour taste in my mouth than the bile I was regularly retching up. What a low blow. How could she ever think that it’s ok to compare someone suffering from a mental illness to people suffering from famine? Just have a cake! There are people starving in Africa/Asia/our own country....! Not only extremely reductive of a deadly mental illness but also untrue. We are lucky in the west to have access to psychiatric practices. That support to even diagnose illness (let alone address) is very often just not available, especially in war torn countries. So there could be far more unreported incidents of Anorexia but studies of mental health in the non-western world are far less abundant. Thankfully these days that IS changing. (quoted from Jennifer Hatfield’s study on the implications of non western Anorexia.) That is to say that a person’s Anorexia has not been caused by her/his up-bringing in western culture even if that culture has perhaps exacerbated it. We have to be really careful about how we treat the younger generation. No one should be treated with belittling derision about their “silly obsession with appearance”. People in their late teens, early 20s are among the most vulnerable of all but also arguably the most important. They are the ones who will shape our future and they are the ones who will ultimately be responsible for progression in our society. We should show them more respect and not reduce their experiences, (especially not in the media) to silly nonsense. My conclusion is this, if you have an opinion, make sure you do some flipping research before you spout your “truth” to the world. It's such ignorance to think you can link anorexia to being simply just hungry. It worries me that someone who can be seen as influential would say things like this.